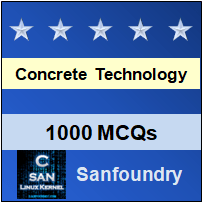 This set of Concrete Technology Multiple Choice Questions & Answers (MCQs) focuses on “Various Testing Methods”. 1. Which test is used to determine dimensions of any object? 2. Identify the type of destructive testing. 3. Which test can be performed without skilled labor? Explanation: Dye penetrant test does not require any skilled labor. This method only detects surface discontinuities and this test needs to be observed with naked eyes or with low magnifying glass. Explanation: Compressive strength of hardened concrete is done by cube test. For cube test two types of specimens either cubes of 15cm X 15cm X 15cm or 10cm X 10cm x 10cm depending upon the size of aggregate are used. 5. In the soundness test a specimen of hardened cement paste is _______ for a fixed time. Explanation: On cooling below 1250oC, C3S decomposes slowly but, if cooling is not too slow, C3S remains unchanged and is relatively stable at ordinary temperatures. 8. What is final setting time? Explanation: The final setting is defined as the time taken to reach the cement paste to become into a hardened mass. 9. The loss in weight should not exceed ______ percent when tested with sodium sulphate and ______ percent with magnesium sulphate solution.